Prepare lemon curd. Beat sugar and butter at medium speed until blended. Add 4 eggs and 3 egg yolks, one at a time, beating just until blended after each addition. Stir in lemon zest. Gradualy add lemon juice, beating at low speed until just blended after each addition. (Mixture will look curdled.) Transfer to large heavy saucepan. Cook mixture over medium-low heat, whisking constantly, 14-to-16 minutes or until thickened, coats the back of a spoon, and starts to mound slightly when stirred. Transfer mixture to a bowl. Place plastic wrap on surface of warm curd (to prevent film from forming) and cool one hour. Chill 8 hours. Prepare cake layers. Preheat oven to 350 degrees. Beat 1-3/4 c sugar and 1 c softened better at medium speed until fluffy. Add 4 egg yolks, one at a time, until just blended after each addition. Stir in orange zest. Sift together cake flour and dry ingredients. Gradually add to butter mixture alternately with 1 c orange juice, beginning and ending with flour mixture, beating just until blended after each addition. Beat 4 egg whites at medium-high speed with mixer until stiff peaks form. Fold 1/3 of egg whites into batter. Fold remaining egg whites into batter. Pour into four greased 8-inch round cake plans. Bake 17-20 minutes. Cool in pans 10 minutes, turn out and allow to cool completely. Reserve and refrigerate 1 c lemon curd. 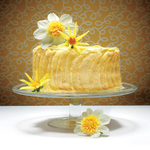 Spread remaining lemon curd between cake layers and on top of cake. Insert skewers 2-to-3 inches into cake to prevent them from sliding. Immediately wrap cake tightly in plastic wrap and chill 12-to-24 hours. Will set up firm overnight, ripen flavor and make more secure and easier to frost. Prepare frosting - beat all ingredients together. Remove and discard skewers. Spread frosting on sides of cake. Spread remaining curd over top of cake for decorative finish.